Here’s a fantastic annuals list. It’s one I ordered from Mason Gardens for my clients and am still in the process of getting together for them. I mentioned I’d have this up on Fresh Air on Sunday. So I’m late. Everything’s late. 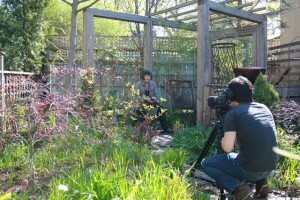 I’ve done a bunch of videos for the Globe and Mail and the column starts on May 28th. Monique Dobson took this picture of us working away. I must say we had fun and they should be on the Globe’s web site this week. I dug out the grass years ago in the side and back and have never regretted it. Makes for muddy paths but the toes enjoy it and that is a gift after a long day. I’d do the same in the front though neighbours cats would make it their litterbox so have held off. Your list is intriguing. The names alone make me want to search them out. Happy Spring and may colours of your garden bring you sunshine. You mentioned in a previous post that Jack had heart surgery. I hope he’s recovered and thriving. There are so many annuals, really good ones this year that I’m gobsmacked by them. I just cull out the ones that work with my plants and hope they’ll help people make some decisions. Hey there there administrator, I truly wished to place a short mention to express that in fact I liked your specific posting. Thanks!